Please note alcohol is not permitted on the premises. The Hall costs £13 per hour. The Hall seats 70. Half an hour setting up and clearing up time is allowed either side of your timed event. 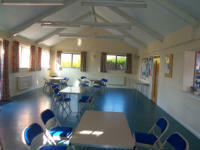 Other smaller rooms are available at a lower hire rate. The kitchen is fully equipped with gas cooker (8 rings), dishwasher, fridge/freezer, Lincat hot water unit, microwave. Crockery and cutlery are available for up to 70 people. You are welcome to come and look at our premises by arrangement to see if they are suitable for your needs. Our premises are made up of the Church Worship Area, Welcome Area, Jubilee Lounge, Vestry, Hall, Kitchen, Toilets, Upper Room and Car Park with Garden. These premises are designed for easy access with designated parking for those with disabilities, two external ramp entrances and a stair lift to the Upper Room. The Worship Area and the Hall are both equipped with loop systems. The Worship Area has an audio/visual operating facility.